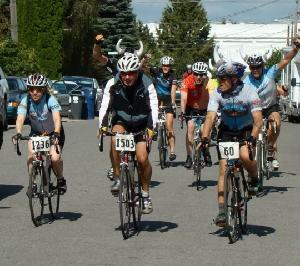 This Sunday, August 11, the Biking Vikings will be holding the 1st Annual Odin’s Viking Fest at the Asgard Tasting Room in in Fremont neighborhood from 3pm to 7pm. The event will go to help the National MS Society fund research, advocate for change and help people with MS. The Asgard Tavern is Odin Brewing’s new satellite tasting room conveniently located just off the Burke Gilman Trail and just a couple of blocks away from Fremont Brewing (bar crawl!). They have plenty of Odin beers on tap, including standards like Freya’s Gold and Odin’s Gift, as well as special casks and seasonal beers. The Biking Vikings are on a mission to raise money for MS, and they are asking for donations of $25 or more. That will get attendees guaranteed entry, their first drink, a special Viking Stew from “Now Make Me A Sandwich“, as well as a chance to win great door prizes. Besides beer and food, there will also be live music from “Turn Left On Blue,” Viking games, and more. Viking regalia is encouraged. You can donate any amount at the door, but registering online* makes sure that you get in as we could sell out! *By “registering online” I think they mean making your donation online. If you click on the “Donate to Viking Fest” link here, you can make a gift and include your information. The BIKING VIKINGS are asking you to support us in Bike MS because this is a cause that is meaningful to us. We have friends, family, and teamates who live with MS. Multiple sclerosis interrupts the flow of information between the brain and the body and it stops people from moving. Symptoms range from numbness and tingling to blindness and paralysis. The progress, severity and specific symptoms of MS in any one person cannot yet be predicted, but advances in research and treatment are moving us closer to a world free of MS. Your $25 (or more!) gift helps provide local programs and services for people affected by MS, and funds cutting-edge research, putting us closer to realizing our promise to STOP MS in its tracks, RESTORE lost function and END MS forever. Ending MS means no one will hear the words, “You have MS” ever again. Every dollar counts! All donations fight Multiple Sclerosis, Odin is donating 50% of all sales! Come drink some beer! On behalf of the family and friends we ride for, thanks for raising awareness of this event, Geoff!